Day 2 of the 2012 Medjugorje Youth Festival. Bishop Monsignor Domenico Sigallini , head of the World Youth Days in the Vatican. Bishop Sigallini holds a catechesis on the theme, "Lord, multiply our faith." Justina lived a life without God. The belief was her biggest lie. 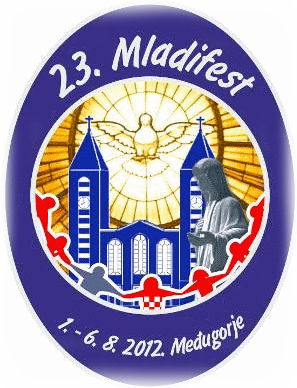 Through a friend, she came unwillingly to Medjugorje. During worship, she suddenly felt, God is real. "Nothing has evolved in my life the way I've planned it all got better.."
Day 3 of the 2012 Medjugorje Youth Festival. Father Timothy formally a model , attended the police academy, was responsible for the protection of the Prague President. Now he is a religious and fights for the Gospa. Rev. Dr Ignaz Hochholzer , Vienna. Is a senior physician at the Brothers of Charity, Vienna. He is a doctor in body and mind and learned of his calling in Medjugorje. Magnus is founder of Mary's Meals and his goal is to provide starving children a daily hot meal at school in the poorest countries of the world . Day 4 of the 2012 Medjugorje Youth Festival. Day 5 of the 2012 Medjugorje Youth Festival. Community was by Sr. Elvira founded, now there are about 65 houses in many parts of the world. Don Ivan from Tomislavgrad is 2nd Priest Cenacolo Community . He's gone through the hell of drugs. According to his testimony, he was touched by God and Our Lady. His conversion is in connection with Medjugorje. Member of the Community Cenacolo . Emilia 18 years ago, has been diagnosed with MS. Now she is in a wheelchair and talks about her precious bye n Through her illness she became a believer. Josco H. from Croatia bouncer addict. Through the Community Cenacolo he came back to life, found true friends. From the road to the monastery! 10 years she was a drug addict, living on the streets. Now it has been 4 years in the Community Cenacolo was baptized there and felt the call to the consecrated life. Graduate Social worker, head of the initiative, "I was an embryo", the largest Pro Live initiative in Croatia. He testifies about his life, his conversion and his work. Diana of America is a member of the of St. Patrick school of Evangelism. in England and would like to invite the young people mainly from England to join in spreading the Evangelism in England.